V.E. 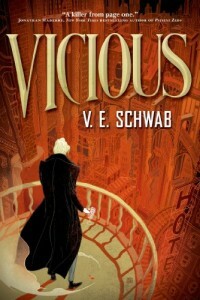 Schwab’s Vicious had a lot to recommend it: an eye-catching cover, rave reviews from authors I trust, and a premise that promises to toy with superhero and villain tropes in interesting ways. The problem is that I never really bought the way the main characters get their powers, and that ended up souring me on the book. It also didn’t help that Vicious seemed to have ambitions of subverting the genre but fell prey to some of its hoariest clichés. Victor Vale and Eli Cardale are college roommates and unlikely best friends. Victor is an anti-social misfit and Eli has every appearance of all-American normality, but as they get to know each other, it quickly becomes clear that they share not only an ambitious drive to succeed but also a darkness boiling just under the surface. Their relationship comes to a crucial turning point when Eli starts working on a term paper examining the source of “extra ordinaries” or “EOs” – near-mythical human beings with super-powers – and Victor suggests they try to put Eli’s findings into practice. When Eli brings up the topic of EOs, that is the first real hint we’re given that we are dealing with a world that isn’t quite our own. Eli mentions EOs and everyone in his class knows what he means, but the world of Vicious doesn’t seem to have the concept of traditional comic book superheroes and villains. EOs may exist, but they certainly don’t run around wearing capes or acting under flamboyant pseudonyms. Honestly, I think this reveal is where I started having problems with Vicious. The world-building felt a little shaky at this point and things only got worse from there. After Eli announces his intention to write about EOs, it isn’t long before he theorizes that near-death experiences are connected to EO powers and Victor convinces him to test that out. Before you know it, they’ve performed a few incredibly irresponsible experiments and become super-powered under conditions that just feel trivial. Eli and Victor’s experiments aren’t at all scientific or rigorous, and Schwab never provides an explanation for their powers that I found satisfactory. The only thing that made sense to me was that they must live in an alternate universe where anyone who almost dies comes back super-powered. That would create a lot of EOs, but doesn’t jibe with the way everyone in Vicious treats EOs as nothing more than a fanciful rumor until Victor and Eli start digging into the subject. Schwab tells us how EOs happen but never explains why, and that bothered me the whole time I was reading. It’s a shame, really, that I got so hung up on the basic building blocks of this story, because Vicious was reasonably entertaining at points. The characterization was decent, the moral grey areas were impressively large, and the details of the world were tantalizing enough that I wanted to know more than Schwab delivered. Vicious is a book with a few cool ideas that ultimately don’t pay off, but I do think it speaks to the potential of its author. I’ll be curious to see what else Schwab writes, and it’s possible I’ll give another one of her books a shot some day. Unfortunately, this one just wasn’t my cup of tea.